To safeguard people and property in all our rural communities through awareness, communications and education. Awareness will be achieved through membership development, public meetings and support from local businesses. Communications will include an updated membership database fan-out information system for email and phone notifications, information sharing with local RCMP, website development for information flow and resource connections, public relations and use of print or other media. Education with respect to crime prevention resources will be shared. 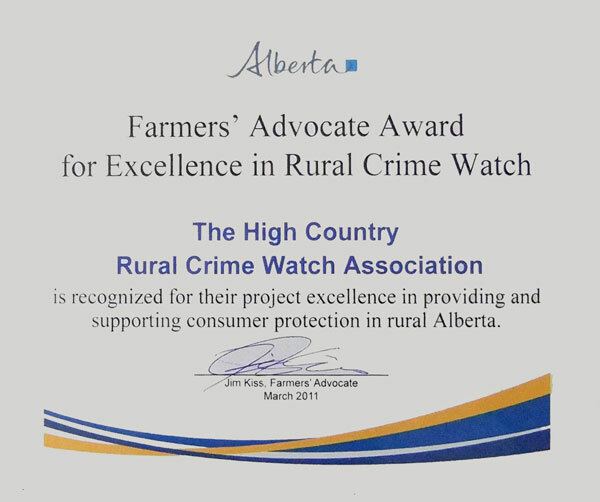 The Alberta Provincial Rural Crime Watch was formed to assist the RCMP in recognizing and apprehending criminals or those who have purportedly committed crimes. The Rural Crime Watch (RCW) Program was designed to reduce the incidence of crime in rural areas and to create a more thorough understanding and awareness of the laws. It is completely voluntary, involving rural residents working in cooperation with their local RCMP detachments. The RCW Program as we know it began in 1979 supported by four local associations: The Alberta Cattle Commission, the Western Stock Growers’ Association, the Farmers Advocate, and the RCMP. Since then, local associations have developed throughout the province. These were not linked by a provincial body prior to 1994. 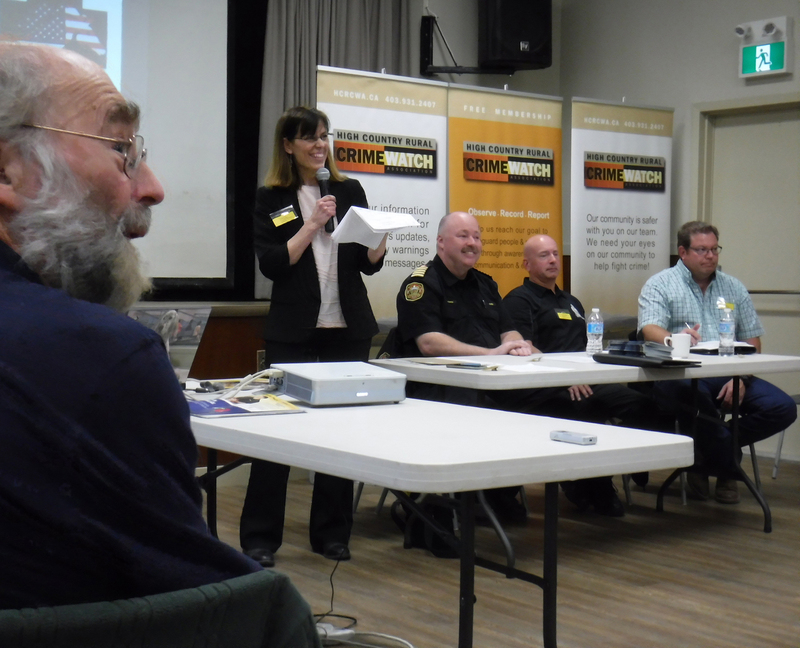 In 1995, the Provincial Rural Crime Watch Association received official recognition as a society and the organization has become a substantive force in the province. The scope of the Rural Crime Watch Association has expanded. Associations are now concentrating their efforts on farmstead security, property identification and general rural crime awareness. The Range Patrol Program continues, plus the “Report A Poacher” program has been included. 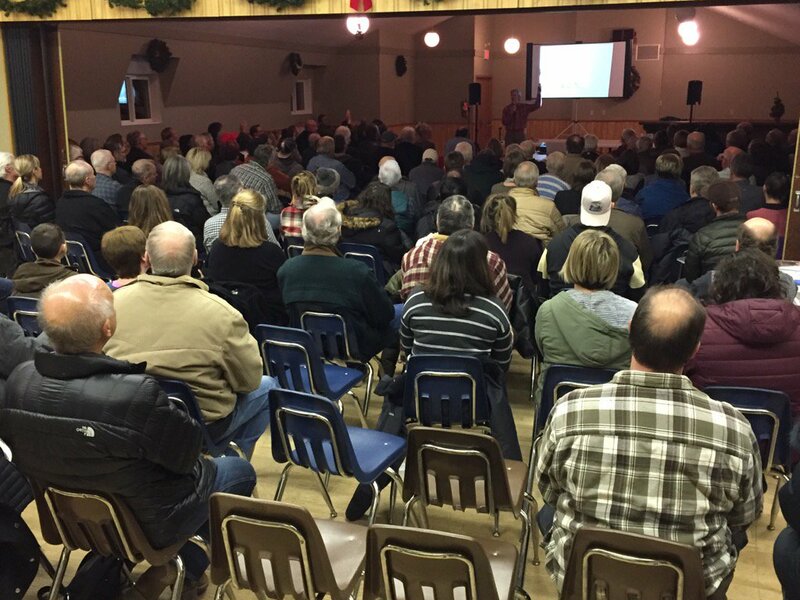 There are now approximately 57 Rural Crime Watch groups in Alberta. HCRCWA is part of the Provincial Zone 1, which encompasses Southern Alberta. The area we cover is the western portion of the MD of Foothills (immediately southwest of Calgary), with major western parts of MD Divisions 2, 3 and 4. Within this, we have 6 areas, for which we have designated area representatives. Originally started in 1981, the HCRCWA had lapsed its operations in our area, for a time. Due to an increase in criminal activity and interest by the community, the group has been re-established as of March 2010, and is currently setting up its communication networks and future goals. HCRCWA is working on a fan out information network via email and phone (to those who do not have email). The group will continue to hold public meetings to inform more of our communities and encourage membership. Also, we are working on a website which will connect residents to other important crime prevention information and groups. We would like to introduce you to our team: President – Suzanne Oel; Vice President – Lyn Dean; Treasurer – Suzanne Lukawitski; Secretary - Joan Paterson; Membership Coordinator (Board position) – John Robin Allen; Board Member at large #1 – Mike Brunner; Board Member at large #2 - Debbie McGuinness; Turner Valley RCMP Liaisons Corp. Tiffany McGregor & Staff Sgt. Dwayne Helgeson; and area representative & events coordinator Donna Hanson. Also, many thanks go to our behind the scenes volunteers! The HCRCWA Team is very pleased to have received the Farmers' Advocate Award. Graham Gilchrest attended our meeting to present us with a framed certificate. A cheque for $1,000.00 -yeah- has already been received! The history of Rural Crime Watch in Alberta, starting in 1979, includes the Farmers Advocate (as in the summary on our general letter). Check this link out for more info on the Farmers Advocate. Benefits: Being a HCRCWA member will connect you to a network and being a part of an over-all safer community. You will benefit by being part of an information system in communication with RCMP news updates. We also want to communicate other valuable information, tips and updates to members to let them know what is going on. We think it is very important that you get to know your neighbours, to help to identify suspicious activity and report it. Plus, you can invite your neighbours to become HCRCWA members to spread the impact of this group. You will help to reduce crime in our area by being the eyes and ears to assist the RCMP. Being a part of a healthy crime watch system will help the RCMP and help ourselves. Your assistance with any aspect of the association related to membership, becoming an Area Rep., writing articles, assisting at public meetings, assembly of membership packages, or other areas as needed, would be so greatly appreciated. For more information or to volunteer, please contact us.